You can learn to read, write, speak and understand basic Spanish in as little as one semester. The more Spanish you know, the more your skills will be in demand for the second most-spoken language in the U.S. Spanish also is widely spoken in more than 20 countries in the Americas and Europe. Enjoy an interactive classroom environment. Write in Spanish about relevant topics in your daily life. Listen to passages in Spanish to train your ear and gather information from speakers with diverse backgrounds. Read and watch videos about the cultures of the Spanish-speaking regions of the world. Visit our Spanish tutors in person or online for extra practice at no cost to you. In addition to Elementary Spanish I and II and Intermediate Spanish I and II, you can take an occupational Spanish class that will help you in the hospitality industry. As your skills and fluency improve, you might consider taking conversational Spanish to help you work with Spanish natives or to use while traveling. If you grew up speaking Spanish but have had little or no formal Spanish grammar training, there is Spanish for Heritage and Advanced Speakers of Spanish specifically for you. You may also use this placement tool for enrolling in the right JCCC Spanish course. Although Spanish is a popular course, you will find JCCC classes to be small and interactive. Native or near-native Spanish-speaking professors encourage peer and small group collaboration. Take advantage of free tutoring in the Language Resource Center (LRC) as well as online. Join the Spanish club, Amigos sin Fronteras, to practice your language skills with fellow students. 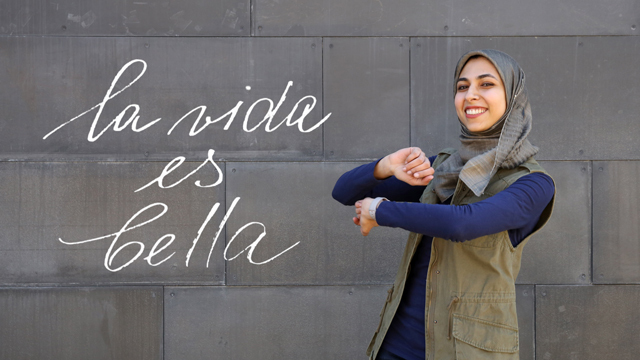 Meet native Spanish-speaking students through the International Club, and make new friends. Investigate JCCC’s Study Abroad programs for travel and study in a Spanish-speaking part of the world. If you’re fluent in Spanish and looking for part-time work while in school, check out the work-study opportunities in the LRC. Set yourself apart from other job candidates. A recent MIT study showed that knowing Spanish can increase your hourly earnings by 2 percent annually. Even fields like business and law benefit from fluent Spanish speakers since Latin American companies are some of the most important trading partners for the U.S.
Two years of Spanish meets the foreign language requirement for many bachelor’s degrees. Most Spanish courses at JCCC are guaranteed to transfer to all Kansas public postsecondary institutions.